Catwoman has been an arch-nemesis for Batman for 75 years, becoming an antihero over time and spinning off into her own comic book series. But it turns out we didn't know all there is to know about Selina Kyle, aka Catwoman. 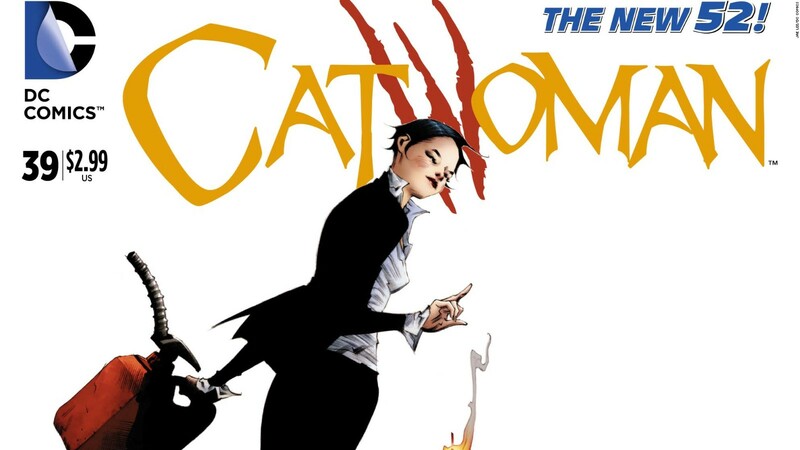 This week's "Catwoman" #39 comic revealed that Selina is bisexual. SICKENING!! This is why comic book sales continue to plummet!! You're joking, right!? Hahaha! Plummeting because Catwoman is bisexual? HAHAHA! For every ridiculous, ignorant, hater of gays and lesbians that stop buying comics for that stupid reason, there's 100 gays and lesbians buying those issues in support of equality. So no, comic sales don't plummet because of a fictional character "coming out"; they are plummeting because this is a digital age, and most kids that do read comics now, will read them online, usually for free. Same thing happened to the music industry YEARS ago, and I assure you, it wasn't because David Bowie, Elton John, Melissa Ethridge, or Freddy Mercury "came out". Hahaha! I-G-N-O-R-A-N-C-E! HAHAHAHAHAHAHAHAHA! Good luck in life buddy! Hope your kids don't grow up bigots like you! Then go and read the bible you galloping great thundertwunt. Theres no place for old dinosaurs in new comics. Jlborowy- if you expect people to respect your beliefs and choices being a douche and disrespectful isn't the way. Also your facts a way off. both print and digital sales of comics are doing exceptionally well. And while I don't agree with circleoffire's point of view its America and he/she/it has the right to express their views. I also doubt people buy comics in support of equality; they buy comics for art, stories or enjoyment. LGBT is seeping into everything, I have no problem with homosexuals, bisexuals.... whatever, but why do we have to see it in everything now? they (lgbt) are trying to ensure it is now the "norm"
LGBT is not seeping into everything, weve always been here, we just didnt have a voice before, get over it. Do you think us having some visibility will suddenly make you think dicks are delicious ? We are part of the norm. Wow, two smart guys in a row. If you have no problem with, "homosexuals, bisexuals.... whatever," why are you so worried about where you see it and how they are "seeping into everything"? The proverbial, "they," have been around since the dawn of time, and it's people like you who are almost worse than the blatant bigots. You pretend like you are alright with it, but you aren't. Also, I'm pretty sure comic book sales are fine. "It" should be the norm that it's OK to accept folks for who they are and want to be, and I think it's great that comics have historically stood up for folks who don't have enough people standing up for them. Only 3.5 percent of the population are lesbians,gay or bisexual . So why does it seem to be around so much in so many different medians ? Because there are too many people like Circleoffire up there, that can't fathom the thought of someone not like themselves having the same rights of freedom and equality that they have. Apparently, somewhere in their copy of the Constitution of the United States of America, there's an asterisk that says "*unless you are homosexual"... Hahaha! Bummer. Where did you get your stats from toots ? A high number of LGBT people read comics, so the change represents comic audiences. Are you telling me that 94.5% of the population are comic readers ? Jlborowy , once again you attack circleoffire- are you a one trick pony? You can express your self but he can't? you piss and moan about equality and freedom to be who you are but that only applies to the LGBT community? sinking down to that level for your cause or beliefs only ever negates your point. "Because there are too many people like Circleoffire up there, that can't fathom the thought of someone not like themselves having the same rights of freedom and equality that they have." All he did was express "his" belief on something which he has the same effing right to do so as you so get the fuk over yourself. Hahaha.... Catwoman is bi. That just makes her a hotter comic book character. But come on like no one couldn't tell. She's greedy. Lol. Now we can see even more awesome pics of catwonan, poison ivy, and Harley. Does this really surprise anyone who knows, or has read, anything about the Catwoman character? She oozes sexuality no matter who is around. Male or female. To me the surprise is not that she is bi-sexual, but rather it took this long for them to include it in her character. At the end of the day, though, all I really want to see is them writing strong scripts and stories around her. I do not really care about her choice in partners. The reason why its plummeting is because for the simple fact that we have to delieratly make something out of this. more left wing crap that the rest of us are sick too death of.. peter parker, sues brother johnny, lady thor it goes on and on.....whats next a gay blond woman power man in a F$#@ing wheel chair.. you guys have the balls to say where haters?? facts dont care about feelings.. read the Norse mythology.. Tyra is the female like thor. more political bullsh##. everytime a comic company wants to point out the fact their gay, their black, their a woman,, its pathetic and bigoted, and the only thing that has happened is that we get to feel better about ourselves. haters? really! OMG! Who really cares? People have the right to say or write whatever they want to. Who cares if she bi- sexual tri- sexual, green , black, purple. Its a COMIC BOOK! Life is what it is and people need to chill out and just go with the flow. What the next person does really isnt anyones buisiness but if they feel like sharing it, oh well, just let them. Is it hurting you? Peole need to stop seeing color or sexual preference, political standing or whatever. If the person is not what, in your opinion, is "the norm" then there just not. Move on to whatever suits you and leave it be. If something isnt bothering you about a situation, then you wouldnt bring it up. Just like everyone I talk to says" Oh my God Trump is our president, oh no!" but someone had to vote for him, he won.